I am victim of Domain name front running. I searched for domain names on some sites & I lost those names soon. is a way that I found, though I am not sure this is 100% safe or safest possible!? Bypass the registrar when searching for available domains by querying the registry directly. Buy the domain you want as soon as you know it's available. Use a registrar who doesn't have a history of pinching unregistered names of value when you try to register them. ...[use] your computer’s terminal access that connects directly to registry databases, rather than using a web interface through your computer’s browser (see figure below). By doing that, you bypass the “middleman” registrar. Type “whois query.ext” without quotes, where “query” is the domain and “ext” is the extension. 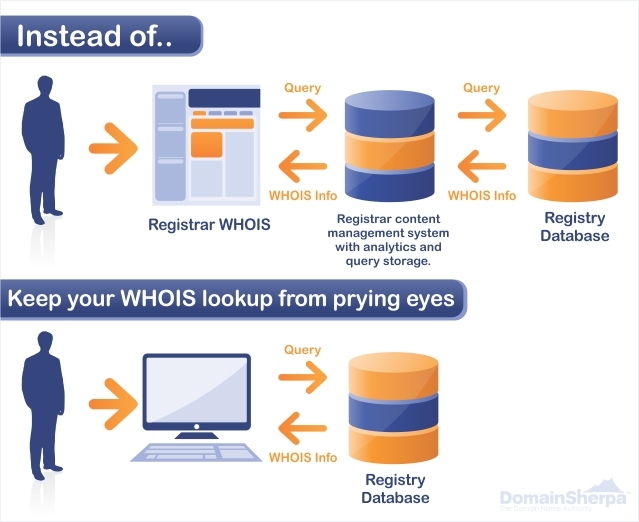 For example, type “whois domainsherpa.com” to perform a WHOIS lookup of this website. InterNIC, which is operated by ICANN, directly via their website. At InterNIC you can do a WHOIS search for the following TLDs: .aero, .arpa, .asia, .biz, .cat, .com, .coop, .edu, .info, .int, .jobs, .mobi, .museum, .name, .net, .org, .pro, and .travel. There are some other tips and resources on this Hacker News thread, where I originally found the article above. nslookup will find DNS information about the domain name. However, if it's been registered, but doesn't have an DNS information, it won't work, even though the domain does exist. whois is the command you want. It's built into Unix-based operating system or can be downloaded from Microsoft. Personally, I prefer not supporting unethical registrars, and especially registrars like Godaddy that are in bed with domainers and spammers. If I need to worry about a registrar ripping me off by pseudo-frontrunning (since frontrunning is technically illegal now), then I wouldn't take my business to that registrar in the first place. Hence, I just search for domains on the registrar I've selected to purchase the domain through. In almost all cases, this is DreamHost's registrar, which I can use right out of my web hosting panel. This also means when I purchase the domain the hosting gets set up simultaneously. It's just less of a hassle all around. I think if you're using a legit web host whose primary revenue source isn't domain name registration, then you can be fairly safe that the registrar they run or use is also fairly legit. I.e. if you're using Rackspace, MediaTemple, Gandi.net, etc. then you should just search for/register domains through them. You can also be pretty confident in registering domains through Google Apps. Web hosts I'd be a little more wary about: HostGator, Bluehost, and obviously Godaddy. Not the answer you're looking for? Browse other questions tagged domains dns domain-registration domain-registrar availability or ask your own question. How do you check on domain availability when it ends in ga.us, ny.us, or something else like that?